Yep, a DIY blackboard. They’re really easy to make. 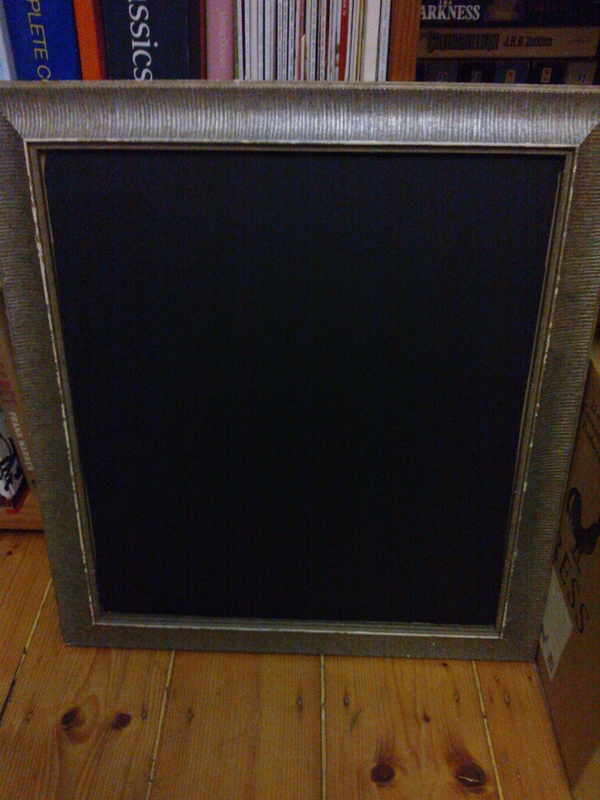 Just wipe the glass clean, protect the frame with some masking tape and some newspaper and apply blackboard paint. Blackboard paint is available at Typo, Bunnings and craft stores. If you’re feeling particularly thrifty, you can probably source your blackboard paint from Freecycle or you can make your own. I used the spray can variety as it creates an even coat and there’s no washing up afterwards. Spray paint can stray a little, however, so keep methylated spirits and or sandpaper on hand to remove any mistakes. It also performs poorly in hot or cold weather; don’t try doing this s*&^ in the height of winter/summer. And always apply spray paint in a well-ventilated area. Once the paint is dry, sandpaper any rough bits, brush the dust off and seal your new chalkboard with a liberal layer of chalk. Wipe the chalk off with a damp rag. Your new chalkboard is ready to be used.